Not quite the Pilgrims’ Way! My recent trip to Whitstable along the Pilgrims’ Way re-ignited my plan to complete the entire ‘track-way’ in a series of day trips. In retrospect I could have benefited from knowing where it started and finished. I decided to complete the section from Rochester to Folkestone, except that Folkestone isn’t part of the Pilgrims’ Way, and I should have included Canterbury. When I think about it, Folkestone isn’t known for it’s cathedral, but anyway I had a lovely day out! Rochester is about as far as I want to go from London for a cycling day-trip. As it was I should have set off from Victoria not Waterloo East, so had to change at Dartford. It took about 1.5 hours, instead of 45 minutes. Ho hum. I picked up Sustrans Route 17 from the station, which took me out through the old town, passed the cathedral, under the M2 and away passed, among other things, a field of ripe peas. The temptation was too great and I stopped to sample a pod, just the one and even that set off a flood of guilty thoughts. Tasted good though! I picked a route that ran level with Sustrans route 17 along this section, as I wanted views across the Medway valley rather than through the chalk hills. My route passed the new suburb of Peters Village, a development that was pleasingly planned with bikes in mind. The freshly tarmaced bike lanes were smooth and empty. Long may they reign! Having safely crossed the M20 via a pedestrian fly-over, I encountered my first un-tarmaced section of the route. I was in the mood for it. Nothing too technical and with a lot of welcome shade. One of the appealing aspects of this track-way is that it is slightly higher than the surrounding countryside, so there is always a view to be had. As I rode on I was surprised by the high ratio of track to road; pleasantly surprised at first, but as the morning wore on, my appetite for the off-road sections waned. My patience finally run out when I encountered a section strewn with hedge-cuttings (including sharp hawthorns) and I baled out onto a small tarmac road which led to the A20. I love the off-roady bits, but doing 50 miles of them would be exhausting and I wanted to get to Folkestone before the sun set! I quickly found myself in the village of Charing and back on small tarmac roads that led to the Church of St Mary’s at Eastwell, where I stopped. The Church was ruined, remote and on the edge of a very still lake, which gave it a slightly haunted feel. I noted the names and messages etched into the walls and imagined all sorts of local shenanigans! The church was at a dead-end (so to speak) so I had a choice; a lengthy detour including a piece of main road, or a footpath. The footpath won (of course), and I happily pushed my bike across the field, eventually passing the entrance to an exclusive Spa Hotel. I imagined turning up en-velo, covered in mud, for a day of pampering, fine-dining and then sampling the quality of their crisp cotton sheets …. allowing my imagination to wander any further was cut short by having to cross a busy road! It was 2 pm, I hadn’t eaten and I felt I had nailed enough of the ride to indulge in an unhealthy lunch. This decision coincided with the discovery of a scene which is forever England; a large village green with a cricket pitch, surrounded by beautifully kept old houses, one of which served interesting local beer and a large bacon and brie sandwich. Is it really 2 3/4 to Stouting?! For me, the next 10 miles was the best riding of the day. This conclusion may have been influenced by a pint of the Flying Horse’s finest ale, plus a hay-fever tablet, and at times I really did feel like a Flying Horse. No stretches of ‘busy or bumpy’, no big hills, just me and the winding road. I glimpsed a wooden church spire across a beautifully manicured lawn, and came across the village of Postling, with it’s age old signpost, red phone box and picture postcard church. It was open and has no doubt offered cool sanctuary for pilgrims and weary travelers since time immemorial, except that it’s not actually on the ‘official’ Pilgrims’ Way, which only made me like it more. I left feeling I’d discovered a secret gem. 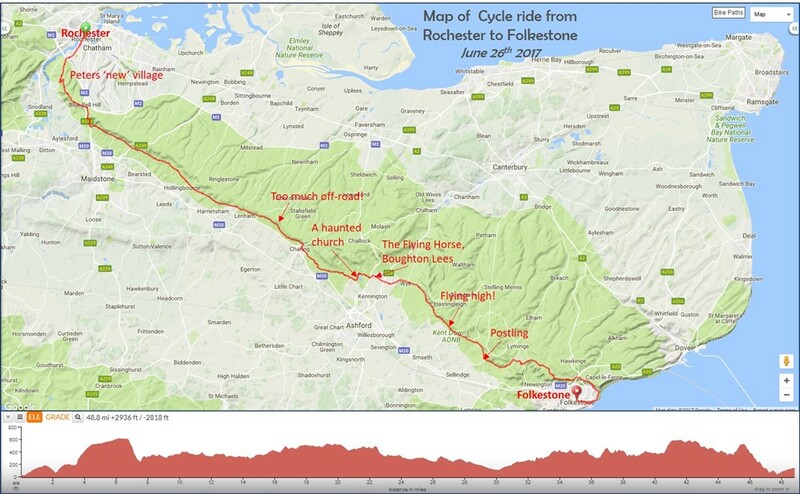 Onwards and the final miles into Folkestone; a section of the route I could have improved on. I wanted to enter the town off the North Downs rather than along a busy A-road, which I did eventually manage to do, but not in the most efficient manner. Nuff said! Just before I left the house, my lodger asked me if Folkestone was still ‘rough’? I had no opinion past or present. My only overnight visit was when I was 6 years old and I shared a room with my Great, Great Auntie Norah. Apparently we got on really well. As I swooped off the North Downs, along a steep path (Sustrans Route 2), I got an answer. The steep narrow cycle track was being used by the locals to test their skill, speed and nerve at ascending the narrow track on motorbike. I avoided collision by a matter of cm’s! Perhaps that was an unfair assessment of the place as a whole!! Having caught the ferry from here on a number of occasions in the 90’s, I was relieved to see the Grand Burstin Hotel, in all it’s concrete glory still dominating the Harbour front. The idea of ‘burstin’ on a grand scale still makes me laugh. I resisted Bill’s Seafood stall along the re-generated harbour front and made the last ascent of the day, up the hill to the Station, where I bought a massive cup of tea, before HighSpeed 2 whisked me back to London Madness. Click here for ridewithgps link. This takes out un-necessary sections of off-road around Charing and includes a better route into Folkestone.